You call yourself a redneck? The paint matches, and its not just primer. Red and Black, you a bulldogs fan? Honestly, how does it ride? Got the shifter hooked up yet? The paint is factory original purty. 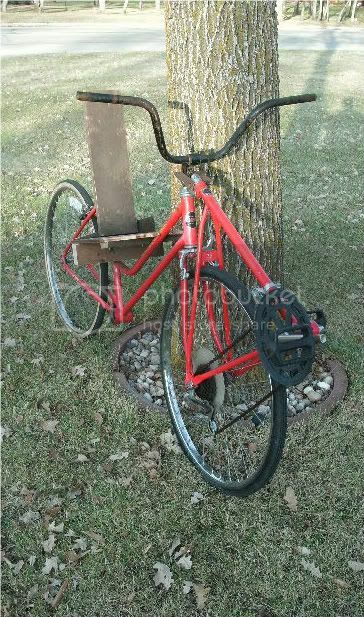 I thought the plywood and board seat qualified it for redneck status! I did sand the slivers down from the fresh cut areas. That's it tho'. That seat is more comfortable than it looks. Even with no pad it seems to beat a regular seat even with a gel pad. Thought it would do for prototyping/testing, until I determine if this thing is junk or not. 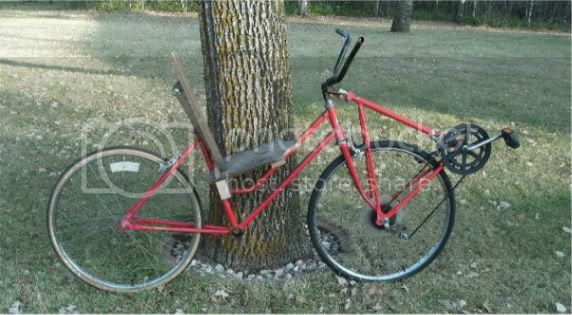 It rides like... a recumbent. That is to say, either I'm a clod or you kinda have to re-learn how to ride a bike, just like a little kid. I haven't crashed it tho'! Shifters and brakes = not hooked up yet. I'm not ready for the top gears anyway. The ergos seem great- very comfortable- but then I don't have any lengthy rides done yet. Last edited by Frank Lee; 11-15-2009 at 04:53 AM..
Great job, Frank. Expected nothing less than a plywood seat from you... honestly. I didn't even have to fire up the welder! Or buy so much as a single bolt. At first I was just going to sort out the ergonomics... wanted something to sit on... went back to the woodpile and picked out stuff that was about the right size... and there it is. Didn't even cut the seat back to size! What? And sand that nice brown paint off?!? At 22.5" at the lowest point, the seat height is decently low for such a bike. I'm going to fab up a different handlebar set-up. My knees brush against this one. If the concept proves itself I'll make nicer components. Last edited by Frank Lee; 11-14-2009 at 02:54 PM..
You may want to consider a lower Cg to aid stability, but I believe you'll enjoy the recumbent position. I DIDNT EVEN THINK THAT THERE ARENT ANY BREAKS!!!!! You are back up (or down) in the evolution pecking order. which appears to have been a "boys" bike. Last edited by Rokeby; 11-14-2009 at 08:03 PM..